The Catechesis of the Good Shepherd program believes that God and the child have a unique relationship with one another and that the growth of this relationship should be assisted by the adult, but is directed by the Spirit of God within the child. Children need their own place to foster the growth of that relationship. With this aim in mind, Catechists (adult guides) use Maria Montessori’s methods to prepare a learning environment called the Atrium, where each week children can explore prayer, scripture, liturgy, Holy Land geography, art expression, and practical life (e.g., sweeping, watering plants, arranging flowers). The Atrium is a community which facilitates children’s participation in the wider community of the family, the church, and other social spheres. The Catechesis program runs September through May, every Sunday from 9:30am – 11:10am. When the Atrium closes at 11:10am, children are welcomed into the concurrently running worship service that begins at 10:30am every Sunday. Our Atrium is designed for children ages 3 to 9. Ready to help your child grow in the light of God? You can click here to register, or call the Parish Office. Q: Do we have to belong to St. John’s to participate? Absolutely not! Any child is welcome in the Atrium, regardless of whether they are part of a family who are members of St. John's. Q: Do parents have to attend St. John’s when the Atrium closes at 11:10? You don't have to join worship at 11:10, but the program will have prepared your child for the Eucharist, and so they may well want to attend. All you have to do is pick your child up, whether you attend worship or not. Q: We are new to the area/St. John’s. Can we join in the middle of the Catechesis program year? Of course! Your child can join at any time. You can contact our Catechesis team to register before you arrive, or fill out the registration forms when you drop your child off. All children are welcome in the Atrium. Q: Does my child need to attend every week? Yes, please. We encourage families to think of joining the Atrium community similar to the commitment of joining an extracurricular team. Consistent participation is what makes the experience most fruitful and meaningful. Q: Are "drop-ins" allowed if my child wants to check it out first or if they have a friend with them who wants to join just for that day? Drop-ins or one-time visits are not allowed. Every child coming to the Atrium must be registered and intend to be a regular weekly participant. Using the team analogy from above, one wouldn't drop by and play on their friend's soccer team for a single game. However, parents are welcome to visit and observe the Atrium (see below) to determine whether or not they want to sign up their children for Catechesis. Q: Can parents visit the Atrium? Yes, parents or other adults may visit and observe the Atrium by coordinating with the Catechists. Q: Do you provide snacks during the atrium? Absolutely. There will be a snack each week. There is a nominal registration fee of $25 per child to cover the costs of materials. Scholarships are available and no child will be turned away due to financial constraints. Q: How many adults will be in the atrium? There are at least two adults in the Atrium at all times (sometimes more), and everyone who is part of our children's formation program has had training in safeguarding children, as well as passed a comprehensive background check. Q: What does the word "catechesis" mean? The word "catechesis" is often defined as oral instruction given to catechumens (those preparing for baptism). It is from a Greek word, related to the word "to teach," and means "resounding" or "echoing down." It refers to the passing on of the truths of our faith. Of course, many children in the Atrium were baptized in infancy and are not actually catechumens, while still others may be completely new to the church. 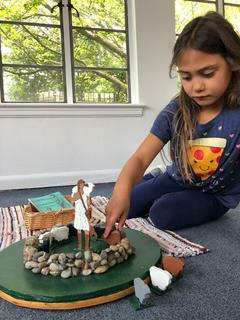 Regardless of the path that leads to the Atrium, each child enters the Catechesis of the Good Shepherd with the invitation to engage in learning, prayer, and skill development that is just right for them. Q: Is Catechesis of the Good Shepherd Roman Catholic? Catechesis of the Good Shepherd is an ecumenical Christian formation program that came about through the work of two Roman Catholic laywomen in Rome in the 1950s: Sofia Cavalletti and Gianna Gobbi. They were inspired by the educational principles of Maria Montessori. In the 1980s, Catechesis was adapted for use with several other Christian traditions, and quickly spread within the Episcopal Church of the USA. Q: Where can I learn more about the Catechesis of the Good Shepherd? You can learn more at the website of the National Association of the Catechesis of the Good Shepherd United States, or by contacting our Catechesis Team at the Parish Office.